What do you hear when someone says, “white pride?” What about “black pride” or “gay pride?” Is there a difference? Explore from unique and differing points of view. Filmmaker Whitney Dow shares his views on white privilege. How Can You Hate Me When You Don’t Know Me? What do you hear when people talk about "white pride?" How do you see it as different from or similar to pride in one's heritage or sexuality? Use the hashtag #WhatIHearPBS to share your thoughts. 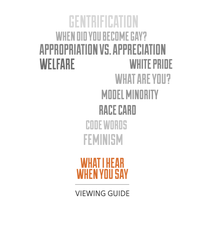 Dig deeper into the conversation with a detailed Viewing Guide: What I Hear When You Say: White Pride.